One of the most popular services on the mesh are cameras. There are two basic types of cameras that can be added to the mesh and they are Analog cameras and IP cameras. The basic difference is that with Analog cameras you will need to use a Video Server to connect the camera to the network, where IP cameras connect directly to the network. Video servers can service one camera or may serve two, four or more cameras. Video servers also come in a variety of data speeds and maximum resolution so be sure to match the resolution of you analog camera with the maximum resolution of your video server. Also, if you camera supports Pan, Tilt, and Zoom (PTZ) make sure the video server does also. Some video servers, as well as some IP cameras, also support digital inputs (DI) or digital outputs (DO). A DI can be used to read the state of a switch or motion sensor. A DO can be used to on a light or sound an alarm. 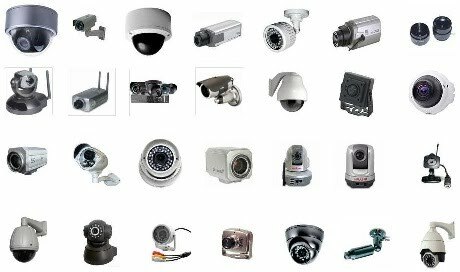 Here are some examples of IP cameras. The one on the left has pan and tilt (but no zoom). It is rated for indoor use but we have used these outdoors or special events with good results. The two cameras in the middle are fixed focus, indoor cameras. They are good if you want to monitor the status of your ham shack (or fish tank) where you can set the camera up and your subject always stays in one location. The camera on the right is rated for outdoor use and comes with PTZ. Typical zoom ranges are 3x, 5x, 10x. The camera on Pleasants Peak has a 22x zoom. Keep in mind that camera resolution varies also. Home units are typically 640x480 while industrial units are 720P or 1080P. Sometimes the manufacture just list the camera as to how many pixels it has. As stated before, if you are going to use an analog camera you will need to pair it with a matching video server. The Grandstream GXV3500 on the left is nice because you can monitor it with a web browser or you can call it using a VOIP video phone. It can also be configured as a video receiver allowing you to monitor other IP cameras on the network. Video servers vary widely in capability and features as well as how many cameras they will support. If you have multiple cameras at one location, using a multi port video server and multiple inexpensive analog cameras may be your best alternative.